The overall capital cost of the (Lavaca Bay) project right now is between $2.5-2.6B. The vessel itself is about $1.5-1.6B with the balance representing the costs of the dredging, jetty construction, and other land based gas process and support equipment. This being the “Yearbook” edition of Maritime Reporter & Engineering News, it would be remiss to not have coverage of LNG, one of the hottest fueling trends in maritime circles, particularly in North America. 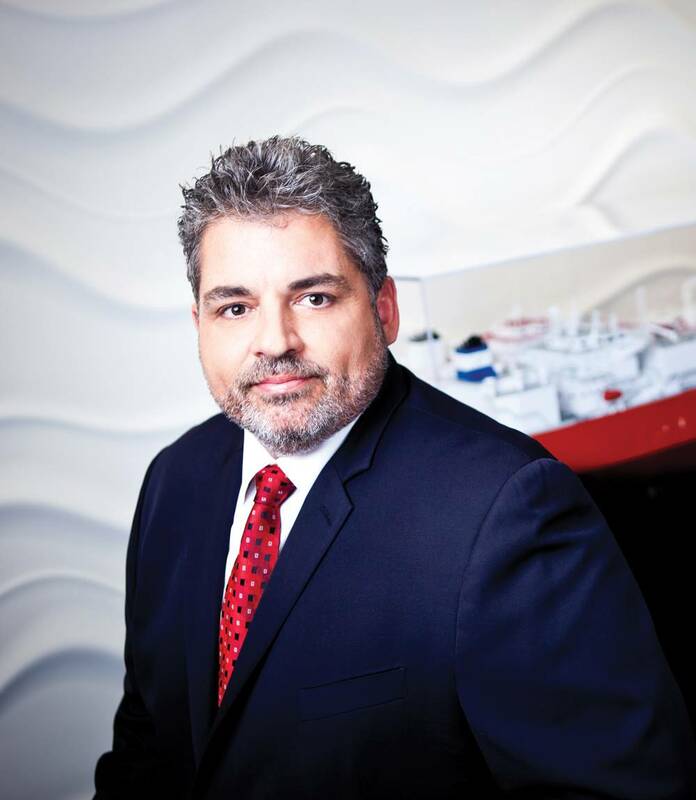 For a unique insight on a rapidly evolving market, MR caught up with Edward Scott, COO, Excelerate Energy, which is making big strides in the LNG Regasification sector, and recently received on the of the world’s largest and most capable units, the FSRU Experience which he touts as the world’s largest and most capable FSRU. For those of our readers not familiar, please describe the business of Excelerate Energy. We are about 105 people, with our core group based in The Woodlands in Houston, Texas, with offices in Rio de Janeiro, Buenos Aires, London, Dubai and Singapore. 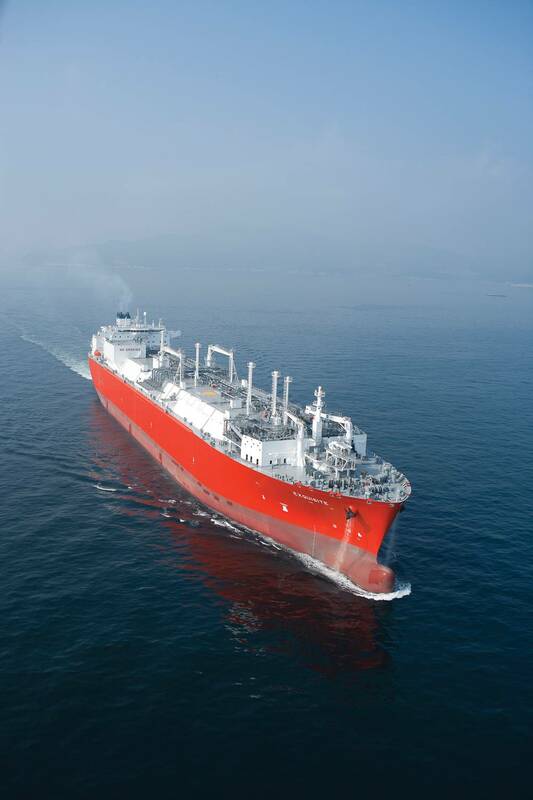 Our current FSRU fleet is comprised of nine purpose built re-gasification vessels including the FSRU Experience, which just delivered from DSME. With a storage capacity of 174,000 cu. m. and peak send out capacity exceeding 1.0 BCF, Experience is the world’s largest and most capable FSRU. However, if you look at the crewing on our ships, our project facilities and our extended team of consultants and contract engineers, we are a far bigger organization. 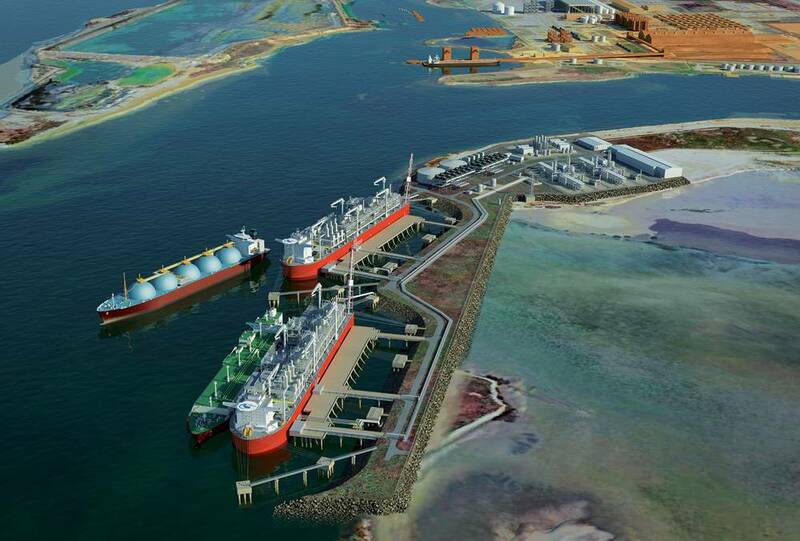 Our business is primarily asset development, meaning we’ll build, own and operate fixed and floating infrastructure and facilitate LNG import and export solutions on a global basis. But we also are fairly significant players in the maritime logistics of LNG; all of our re-gas vessels are also conventional tankers (LNGC’s), so we do a lot of chartering and sub-chartering when our re-gas terminals or vessels of re-gas capability are not required for re-gas specific projects. Additionally, we have a significant trading group that have traded more than 5 million tons of LNG in the last six years or so. So in summary, we are a mid-stream company focused on floating LNG asset development and trading, with the added benefit of nearly a decade’s worth of logistical and operational experience. When I say asset development I mean that we can design, build and operate not just the vessels, but all other aspects of a total import or export solution including pipelines, jetties and offshore moorings, as well as transfer equipment for loading or unloading LNG cargos. We work with our project partners on a case by case basis to define the scope of these opportunities and plan the most efficient execution strategy for each given solution. How many re-gas vessels do you have today? And how many of those are operating as re-gas vessels and how many are operating on trade? At present, we have four of the vessels in term re-gas service … two in Argentina, one in Brazil, one in Israel. We have two other projects that have been sanctioned – one in Puerto Rico and a second in Pakistan where we are working with our respective customers to finalize permitting and other details. In addition, there are more than a dozen other re-gas opportunities that are in various stages of development. We envision that by the end of this year, or latest by the second quarter next year, we will have all of our available re-gas vessels committed to projects. What are the major business segments in which you are engaged? There are four primary segments of the LNG business in which Excelerate is engaged. We have our downstream re-gas business, that is the development of terminal facilities and the term charter of FSRUs to act as import facilities where they are needed around the world. We have a robust trading capability with a team that has traded about five million tons of cargo in the last six years or so along with a complimentary conventional in-charter and out-charter component that is opportunistic based, essentially, on where we are with the utilization of the fleet as re-gas vessels and our trading positions. Our upstream floating liquefaction development activities round out our current areas of focus in the business. It is worth noting, however, that as the market continues to evolve, we are dedicating significant resources to applying the technologies and practices we have developed to solutions both smaller and larger than our current mid-scale capabilities. Can you sum up your near term business prospects in a sentence. We have developed a full suite of midstream value chain solutions and are capable of working from the well head all the way through the downstream LNG marketing downstream, and continue to work with counterparties on a global basis to be midstream partners in monetizing reserves and/or capturing the cost savings and environment benefits of fuel switching in downstream market segments. So what is the key … what is the plan to get to where you want to be? We have developed an extraordinarily solid commercial and technical reputation on a world-wide basis. We have developed technical and commercial solutions in what we like to call the “full value chain:” as such, we have in place all of the pieces required to get to that next level as we move toward the realization of our first upstream LNG production project. So the next critical step in our company’s growth is to find and sanction that first opportunity, whether that’s our Lavaca Bay project or one of the offshore projects that we’re developing elsewhere. We’ll get back to Lavaca Bay in a moment. To set the stage, what are the two or three top trends that are driving your business in the coming five years? Today that equation has changed. With a broader market and competition, we are seeing a lot of potential counter parties looking for more bespoke solutions that are tailored to their specific requirements. Certainly, it makes for interesting challenges for us with respect to how we view the future of our shipbuilding, whether it is on a speculative basis or whether we retain some of our existing assets to bridge some of these opportunities to new builds. It is a little bit of a different dynamic in terms of our business development efforts today, but it still really gets down to a solid commercial and technical solution and a team that’s capable of executing that. From a start-to-finish perspective, the “full solution provider” concept really drives our business in that space. What do you see out there today? I think the worldwide tightness in the LNG supply market is certainly something that we have not seen in our 11 years. It makes for a sometimes interesting market dynamic. Add to that the entrance of the dual-fuel diesel engine propulsion technologies to the new builds, the wave of new builds with this technology that are entering the market. Everybody’s steam turbine ships (including ours) are disadvantaged a little bit on a fuel-consumption basis. Overall though, market dynamics are changing as they always do, and we see a fairly short-term depression in the market until some of these new liquefaction projects come online. As fast as new volumes come online, it seems to me that these new, smaller markets are opening up and stepping right into the breach. So the whole floating LNG world has had a significant impact in the LNG business in the last five years. Consider, for example, that South America was not an LNG consuming region seven years ago. In 2014, more than 100 cargoes will be sold there. As floating technologies gain acceptance, there will continue to be a big shift in the market demographics and dynamic on both the supplier and consumer side. The shale oil and gas revolution obviously has changed a lot in the energy sector. Can you put in perspective for me how the U.S. domestic production of oil and gas has inherently changed your business? It is a story we tell quite often, and it created a fundamental shift in our business. Excelerate’s original business model contemplated, at least to start, that we were going to be a U.S.-centric trading company that had lower cost market access points and controlled its own access to those points. At that point, we were very definitely looking at the U.S. as the center of our business. As such, developing cost effective capabilities to address seasonal and regional demand swings was key to our plan. To that end, we developed our first generation FSRUs as well as complimentary terminal infrastructure in the UK, the US Gulf of Mexico, and in the Northeastern US offshore Boston. As these efforts were completed and moved into commercial operatons, the full impact of the technological advances in the development of shale gas really started to became apparent. And more specifically, what has this meant for your company in both the short term and the long term? With the days of the U.S. as a high volume destination market for global LNG supply coming rapidly to a close, we had to very quickly re-tool our business plan and leverage the technologies that we had developed, looking to a broader, global market, both as a facilitator of trading on a more global basis, but also as an asset development company utilizing the technologies and expertise we had gained to help other countries in other regions access LNG as a lower-priced alternative to some of the liquid fuels they’ve burned for generations. The impact of that was enormous on us. We had always planned on expanding into those areas, but that was always over the horizon for us until the true impact of the shale gas evolution became apparent. Having a great suite of resources and solutions already proven, and a shareholder willing to support the effort were the keys to our success in “reinventing” Excelerate. We understand that you’ve just filed with FERC the formal applications for the Lavaca Bay. I was just wondering if you could give me an overview of that project, how, how you see it panning out, and in what time frame? We started looking at liquefaction as the next logical progression in our business about five years ago. Since then, we have invested a fairly significant amount of time and money – in excess of $40 million– in developing floating LNG production solutions that we feel fit our market goals and overall technical approach. With Lavaca specifically, when we elected to explore the opportunities to export U.S. natural gas, the first thing we did was to scout the Gulf Coast looking for a suitable location to start. Ultimately, we settled on the site in Port Lavaca, Texas. While there are substantial differences between an import and an export facility, in terms of environmental impacts, they are not entirely different. In that sense, the fact that the site had previously been permitted as an LNG import facility was encouraging to us. We liked the site and we liked the local community support we found there. Along with a reasonably close proximity to numerous pipeline interconnection points, we found a very well established industrial and technical workforce base there and a community very familiar with the types of things we do. With the site selected and an interim lease agreement in place, we initiated a site-specific project FEED effort, and began the development of our applications for DOE free trade and non-free-trade natural gas export authorizations and laying the groundwork to enter the FERC pre-filing process. The culmination was the submittal of formal application six weeks ago. If the FERC process follows true to form – without any unanticipated interruptions – we should receive the FERC authorization around the end of the first quarter of 2015. Obviously, the DOE non-free trade export authorization will be key to the project’s success, but while we await that we are making excellent progress with project contracting discussions as well as securing offtake or capacity partners. Assuming that all continues as we expect, we should be in service early in 2019. When you say “in service,” physically what will this facility look like? Building the facility will consist of dredging the 27 mile Matagorda ship channel from the sea buoy up to the port location. That’s deepening and widening the Matagorda ship channel to accommodate vessel sizes up to 175,000 cu. m. The project is designed to be executed in two phases. We’ll build the above ground infrastructure and then the jetty itself in Port Lavaca while the floating liquefaction storage and offloading (FLSO) unit will be built in Korea at Samsung Heavy Industries in partnership with Black and Veatch who will provide the liquefaction process design and key equipment. That vessel will be built, pre-commissioned, delivered from the shipyard and commissioned on site in about 47 months. At a cost of …? The overall capital cost of the project right now is between $2.5-2.6 billion. The vessel itself is about $1.5-1.6 billion with the balance representing the costs of the dredging, jetty construction, and other land based gas process and support equipment. The vessel itself will have 250,000 cu. m. of LNG storage and 4.4 million tons per annum of LNG production capacity. We’re permitting for 10 million tons of export capacity, in order to allow for a second phase of the project if market demand supports it and to allow ourselves a little bit of room for overproduction. In short, we will initially have a single berth, a single vessel, and then the potential to expand to two berths and two vessels. Offloading to conventional LNG carriers will be by ship-to-ship transfer using cryogenic articulated arms. You just segued perfectly into the next question, which is “Your pioneering efforts in the ship-to-ship transfer technology that’s central to your other operations. Can you just give me an overview? So in a dynamic and fast moving market, what is the “Excelerate” advantage? Edward Scott, COO of Excelerate Energy, will deliver the keynote address at the SHIPPINGInsight 2014 Marine LNG Symposium, Sept. 30 in Stamford, Conn.
Scott’s topic – “LNG–New Reality or Simple Evolution” – will set the stage for the symposium, which will include sessions addressing regulatory issues, infrastructure, bunkering, designing and building new LNG-powered ships, retrofitting existing ships and training requirements for handling LNG fuels. Speakers will include experts from all industry sectors.